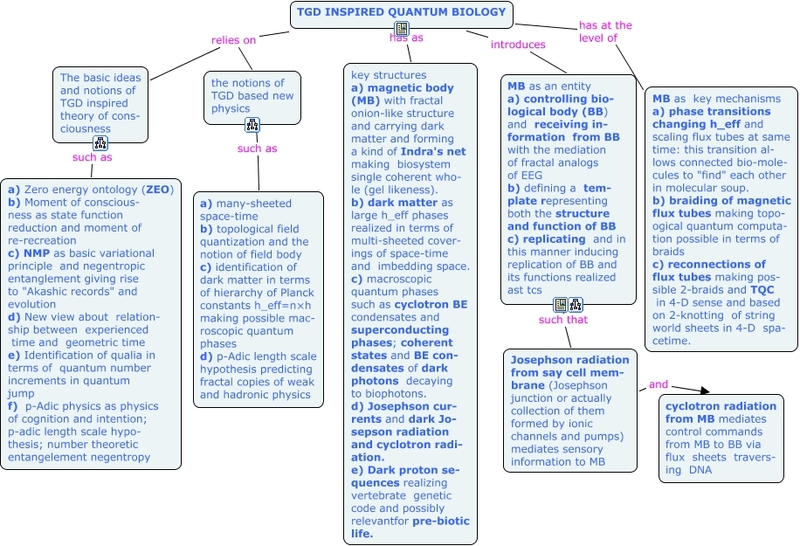 This Concept Map, created with IHMC CmapTools, has information related to: TGD inspired quantum biology.cmap, TGD INSPIRED QUANTUM BIOLOGY relies on The basic ideas and notions of TGD inspired theory of cons- ciousness, Josephson radiation from say cell mem- brane (Josephson junction or actually collection of them formed by ionic channels and pumps) mediates sensory information to MB and cyclotron radiation from MB mediates control commands from MB to BB via flux sheets travers- ing DNA, The basic ideas and notions of TGD inspired theory of cons- ciousness such as a) Zero energy ontology (ZEO) b) Moment of conscious- ness as state function reduction and moment of re-recreation c) NMP as basic variational principle and negentropic entanglement giving rise to "Akashic records" and evolution d) New view about relation- ship between experienced time and geometric time e) Identification of qualia in terms of quantum number increments in quantum jump f) p-Adic physics as physics of cognition and intention; p-adic length scale hypo- thesis; number theoretic entangelement negentropy, the notions of TGD based new physics such as a) many-sheeted space-time b) topological field quantization and the notion of field body c) identification of dark matter in terms of hierarchy of Planck constants h_eff=n×h making possible mac- roscopic quantum phases d) p-Adic length scale hypothesis predicting fractal copies of weak and hadronic physics, TGD INSPIRED QUANTUM BIOLOGY has as key structures a) magnetic body (MB) with fractal onion-like structure and carrying dark matter and forming a kind of Indra's net making biosystem single coherent who- le (gel likeness). b) dark matter as large h_eff phases realized in terms of multi-sheeted cover- ings of space-time and imbedding space. c) macroscopic quantum phases such as cyclotron BE condensates and superconducting phases; coherent states and BE con- densates of dark photons decaying to biophotons. d) Josephson cur- rents and dark Jo- sepson radiation and cyclotron radi- ation. e) Dark proton se- quences realizing vertebrate genetic code and possibly relevantfor pre-biotic life., TGD INSPIRED QUANTUM BIOLOGY introduces MB as an entity a) controlling bio- logical body (BB) and receiving in- formation from BB with the mediation of fractal analogs of EEG b) defining a tem- plate representing both the structure and function of BB c) replicating and in this manner inducing replication of BB and its functions realized ast tcs, TGD INSPIRED QUANTUM BIOLOGY relies on the notions of TGD based new physics, MB as an entity a) controlling bio- logical body (BB) and receiving in- formation from BB with the mediation of fractal analogs of EEG b) defining a tem- plate representing both the structure and function of BB c) replicating and in this manner inducing replication of BB and its functions realized ast tcs such that Josephson radiation from say cell mem- brane (Josephson junction or actually collection of them formed by ionic channels and pumps) mediates sensory information to MB, TGD INSPIRED QUANTUM BIOLOGY has at the level of MB as key mechanisms a) phase transitions changing h_eff and scaling flux tubes at same time: this transition al- lows connected bio-mole- cules to "find" each other in molecular soup. b) braiding of magnetic flux tubes making topo- ogical quantum computa- tion possible in terms of braids c) reconnections of flux tubes making pos- sible 2-braids and TQC in 4-D sense and based on 2-knotting of string world sheets in 4-D spa- cetime.